On November 1, 1755, the Portuguese capital of Lisbon became the site of one of the worst earthquakes in European history. The event had a number of aftereffects, natural and immediate as well as human and longer term. The results from nature were devastating; the earthquake caused a tsunami, or tidal wave, that flooded the Tagus River even as a fire, also caused by the earthquake, raged through the city. Estimates of the deaths related directly or indirectly to the Lisbon quake range from 10,000 to as many as 60,000, making it the worst European earthquake since 1531. That earlier quake, incidentally, also had occurred in Lisbon—another example of the fact that certain areas are more prone to seismic activity. It so happens that Portugal lies near the boundary between the Eurasian and African plates. As for the human response to the quake, it is best represented by the French writer Voltaire (1694-1778). Always a critic of religious faith, Voltaire saw in the incident evidence that called into question Christians' belief in a loving God. He made this case both in the philosophical poem Le désastre de Lisbonne (The disaster of Lisbon, 1756) and, more memorably, in the satirical novel Candide (1759). MICHELL AND THE BIRTH OF SEISMOLOGY. Another, much less famous, thinker responded to the Lisbon earthquake in quite a different fashion. This was English geologist and astronomer John Michell ( ca. 1724-1793), who studied the event and concluded that quakes are accompanied by shock waves. In an article published in 1760, he noted that earthquakes are found to occur near volcanoes and suggested that they are caused by pressure produced by water that boils from volcanic heat. He also indicated that one can calculate the center of an earthquake by making note of the time at which the motions are felt. Today Michell is regarded as the father of seismology, a discipline that began to mature in the nineteenth century. The name itself was coined by the Irish engineer Robert Mallet (1810-1881), who in 1846 compiled the first modern catalogue of earthquakes. Eleven years after publishing the book, which listed all known quakes of any significance since 1606 B.C. , Mallet conducted experiments with shock waves by exploding gunpowder and measuring the rate at which the waves travel through various types of material. As noted earlier, seismology is concerned with seismic waves, which generally are caused by movements within the solid earth. These waves also may be produced by man-made sources. Seismologic studies assist miners in knowing how much dynamite to use for a quarry blast so as to be effective without destroying the mine itself or the resources being sought. In addition, seismology can be used to reveal the location of such materials as coal and oil. Thanks to seismometers (instruments for detecting seismic waves) and seismographs, which record information regarding those waves, seismologists are able to detect not only natural seismic activity but also the effects of underground nuclear testing. Underground testing is banned by international treaty, and if a "rogue nation" were to conduct such testing, it would come to the attention of the World-Wide Standardized Seismograph Network (WWSSN), which consists of 120 seismic stations in some 60 countries. Most of the remainder of this essay is devoted to a single type of seismic phenomenon: earthquakes. As noted, they are far from the only effect of seismic activity; however, they are the most prevalent and well documented. A close second would be volcanoes, which are discussed in the essay Mountains. In A.D. 132, the Chinese scientist Chang Heng (78-139) constructed what may have been the first seismographic instrument, which was designed to detect not only the presence of seismic activity but also the direction from which it came. His invention ultimately was discarded, however, and understanding of earthquakes progressed little for more than 1,600 years. The first crude seismograph was invented in 1703 by the French physicist Jean de Hautefeuille (1647-1724), long before Michell formally established a connection between shock waves and earthquakes. Historians date the starting point of modern seismographic monitoring, however, to an 1880 invention by the English geologist John Milne (1850-1913). Milne's creation, the first precise seismograph, measured motion with a horizontal pendulum attached to a pen that recorded movement on a revolving drum. Milne used his device to record earthquakes from as far away as Japan and helped establish seismologic stations around the world. The first modern seismograph in the United States was installed at the University of California at Berkeley and proved its accuracy in recording the 1906 San Francisco quake, discussed later in this essay. An earthquake can be measured according to either its magnitude or its intensity. The first refers to the amount of energy released by the earthquake, and its best-known scale of measurement is the Richter scale. Developed in 1935 by the American geophysicist Charles Richter (1900-1985), the Richter scale is logarithmic rather than arithmetic, meaning that increases in value involve multiplication rather than addition. The numbers on the Richter scale, from 1.0 to 10.0, should be thought of as exponents rather than integers. Each whole-number increase represents a tenfold increase in the amplitude (size from crest to trough) of the seismic wave. Therefore 2.0 is not twice as much as 1.0; it is 10 times as much. To go from 1.0 to 3.0 is an increase by a factor of 100, and to go from 1.0 to 4.0 indicates an increase by a factor of 1,000. The scales of magnitude thus become ever greater, and while a whole-number increase on the Richter scale indicates an increase of amplitude by a factor of 10, it represents an increase of energy by a factor of about 31. The amplitude and energy measured by the Richter scale are objective and quantitative, whereas intensity is more subjective and qualitative. Intensity, an indication of the earthquake's effect on human beings and structures, is measured by the Mercalli scale, named after the Italian seismologist Giuseppe Mercalli (1850-1914). The 12 levels on the Mercalli scale range from I, which means that few people felt the quake, to XII, which indicates total damage. A few comparisons serve to illustrate the scales' relationship to each other. A score of I on the Mercalli scale equates to a value between 1.0 and a 3.0 on the Richter scale and indicates a tremor felt only by a very few people under very specific circumstances. At 5.0 to 5.9 on the Richter scale (VI to VII on the Mercalli scale), everyone feels the earthquake, and many people are frightened, but only the most poorly built structures are damaged significantly. Above 7.0 on the Richter scale and VIII on the Mercalli scale, wooden and then masonry structures collapse, as do bridges, while railways are bent completely out of shape. In populated areas, as we shall see, the death toll can be enormous. The great San Francisco earthquake, which struck on April 18, 1906, spawned a massive fire, and these events resulted in the deaths of some 700 people, including 270 inmates of a mental institution. Another 300,000 people were left homeless, and 490 city blocks were destroyed. Ultimately, the financial impact of the San Francisco quake proved to be one of the contributing factors in the March 13, 1907, stock market crash that played a key role in the panic of 1907. 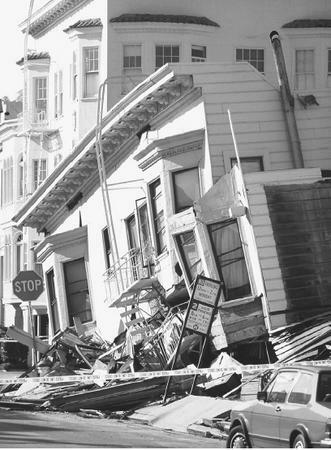 At 5:04 P.M. on October 17, 1989, another quake struck San Francisco. It lasted just 15 seconds, long enough to kill some 90 people and cause $6 billion in property damage. Though it was the biggest quake since the 1906 tremor, it was much smaller: 7.19 on the Richter scale, or about one-fifth of the 7.7 measured for the 1906 quake. The 1989 Loma Prieta quake cost much more than the earlier tragedy, which had caused $500 million in damage, but, of course, half a billion dollars in 1906 was worth a great deal more than $6 billion 83 years later. Neither earthquake, however, was the greatest in American history; in fact, the 1989 quake does not rank among the top 15, even for the continental United States. The eight worst earthquakes in U.S. history all occurred in one state: Alaska. Greatest of all was the March 27, 1964, quake at Prince William Sound, which registered a staggering 9.2 on the Richter scale and took 125 lives. Of that number, 110 were killed in a tsunami resulting from the quake. The high incidence of earthquakes in Alaska is understandable enough, given the fact that its southern edge abuts a subduction zone and, along with the panhandle, sits astride the boundary between the North American and Pacific plates. Although this may not be much comfort to people in Alaska, it is fortunate that the most earthquake-prone state is also the most sparsely populated. Had the epicenter (the point on Earth's surface directly above the hypocenter, or focal point from which a quake originates) of the 1964 earthquake been in New York City, the death toll would have been closer to 125,000 than 125. GREATEST QUAKES IN THE CONTINENTAL UNITED STATES. Similarly, it is fortunate that the greatest quakes to strike the continental United States outside California have been in low-population centers. Of the 15 worst earthquakes in U.S. history, only one was outside Alaska, California, or Hawaii. In fact, it was the site of both the worst and the fifth-worst earthquakes in the continental United States: New Madrid, Missouri, site of a 7.9 quake on February 7, 1812, and a 7.7 quake just two months earlier, on December 16, 1811. New Madrid lies at the extreme southeastern tip of Missouri, near the Mississippi River and within a few hundred miles of several major cities: St. Louis, Missouri; Memphis and Nashville, Tennessee; and Louisville, Kentucky. Had the 1811 and 1812 quakes occurred today, they undoubtedly would have taken a vast human toll owing to the resulting floods. As it was, some lakes rose by as much as 15 ft. (4.6 m), streams changed direction, and the Mississippi and Ohio rivers flowed backward. Fortunately, however, they occurred at a time when the Missouri Territory—it was not even a state yet—and surrounding areas were sparsely populated. The combined death toll was in the single digits. THE WORLD'S MOST DESTRUCTIVE QUAKES. None of these U.S. quakes, however, compares with the July 27, 1976, earthquake in T'ang-shan, China. The worst earthquake in modern history, it shattered some 20 sq. mi. (32 km sq.) near the capital city of Beijing and killed about 242,000 people while injuring an estimated 600,000 more. There are several interesting aspects to this quake, aside from its sheer scale. One is sociological, involving the human response to the quake. As in Portugal in 1755, people saw events in a cosmic light; in this case, though, they did not interpret the quake as evidence of divine unconcern but quite the opposite. Mao Tse-tung (1893-1976), by far the most influential Chinese leader of modern times, had just died, and the Chinese saw the natural disaster as fitting into a larger historical pattern. In the traditional Chinese view, earthquakes, floods, and other signs from the gods attend the change of dynasties. Also interesting is the fact that the T'angshan quake was merely the most destructive in a worldwide series of quakes that took place between February and November 1976. In the course of these events, 23,000 people died in Guatemala after a February 4 quake; 3,000 people were reported dead, and 3,000 more were missing in Indonesia, as a result of a series of quakes and landslides on June 26 (later, the U.S. Federal Emergency Management Agency, or FEMA, placed the number of dead from the Indonesia quake at just 443); as many as 8,000 people died in an earthquake and tsunami that hit the southern Philippines on August 16; and 4,000 more perished in a November 24 quake in eastern Turkey. Similarly, a few months before the 1755 Lisbon earthquake, a quake hit northern Iran. This is an aspect of seismology that cannot be explained readily by plate tectonics: Iran and Portugal are not on the same plate margins; in fact, northern Iran is not on a plate margin at all. Likewise, the areas hit in the 1976 quakes were not on the same plate margins, and T'ang-shan (unlike the other places affected) is not on a major plate margin at all. Nor is Shansi in north-central China, site of history's most destructive earthquake on January 24, 1556, which killed more than 830,000 people. Note that the 1556 and 1976 Chinese quakes were the worst, respectively, of all history and of modern times—but worst in terms of intensity, not magnitude. One might say that they were the most destructive but not the worst in pure terms. The 1976 quake is not even on the list of the 10 worst earthquakes—those of the greatest magnitude—in the twentieth century. Whereas the T'ang-shan quake registered 8.0, a quake in Chile on May 22, 1960, had a magnitude of 9.5, or about 50 times greater, yet the death toll was much smaller—2,000 people killed. Three thousand more were injured in the Chilean quake, and two million were rendered homeless. The last statistic perhaps best signifies the magnitude of the 1960 quake, which caused tsunamis that brought death and destruction as far away as Hawaii, Japan, the Philippines, and the west coast of the United States. As noted, plate tectonics does not explain every earthquake, but it does explain most, probably about 90%. Not that it is much help in predicting earthquakes, because the processes of plate tectonics take place on an entirely different time scale than the ones to which humans are accustomed. These processes happen over millions of years, so it is hard to say, for any particular year, just what will happen to a particular plate. Plate tectonics, then, tells us only areas of likelihood for earthquakes—specifically, plate boundaries of the types discussed near the end of Plate Tectonics. And even though the processes that create the conditions for an earthquake are extremely slow, usually the discernible indications that an earthquake is coming appear only seconds before the quake itself. Thus, as sophisticated as modern seismometers are, they generally do not provide enough advance notice of earthquakes to offer any lifesaving value. There are not just a few earthquakes each year but many thousands of tremors, most of them too small to register. Sometimes these tremors may be foreshocks, or indicators that a quake is coming to a particular area. In addition, studies of other phenomena, from tidal behavior to that of animals (probably a result of some creatures' extremely acute hearing), may offer suggestions as to the locations of future quakes. EARTH'S CORE AND THE MOHO. Seismology is useful for learning about more than just earthquakes or volcanoes. During the early years of the twentieth century, the Irish geologist Richard Dixon Oldham (1858-1936) studied data from a number of recent earthquakes and noticed a difference in the behavior of compression waves and shear waves. (These terms merely express the differences in stress produced by seismic waves.) As it turns out, shear waves are deflected as they pass through the center of Earth. Since liquid cannot experience shear, this finding told him that the planet's core must be made of molten material. Oldham's findings, published in 1906—the same year as the great San Francisco quake—made him a pioneer in the application of seismology to the study of Earth's interior. Three years later, studies of earthquake waves by the Croatian geologist Andrija Mohorovicic (1857-1936) revealed still more about the interior of the planet. Based on his analysis of wave speeds and arrival times, Mohorovicic was able to calculate the depth at which the crust becomes the mantle. This change is abrupt rather than gradual, and the boundary on which it occurs is today known as the Mohorovicic discontinuity, or simply the Moho. Abbott, Patrick. Natural Disasters. Dubuque, IA: WilliamC. Brown Publishers, 1996. National Earthquake Information Center—World Data Center for Seismology, Denver (Web site). <http://neic.usgs.gov/> . Prager, Ellen J., Kate Hutton, Costas Synolakis, et al. Furious Earth: The Science and Nature of Earthquakes, Volcanoes, and Tsunamis. New York: McGraw-Hill, 2000. Seismology Info Page—Netherlands (Web site). <http://home.wish.net/~riknl/> . Seismology Research Centre—Australia (Web site). <http://www.seis.com.au/> . Sigurdsson, Haraldur. Encyclopedia of Volcanoes. San Diego: Academic Press, 2000. Sleh, Keery E., and Simon LeVay. The Earth in Turmoil: Earthquakes, Volcanoes, and Their Impact on Humankind. New York: W. H. Freeman, 1998. University of Alaska Fairbanks Seismology (Web site). <http://www.aeic.alaska.edu/> . University of Washington Seismology and Earthquake Information (Web site). <http://www.geophys.washington.edu/SEIS/> . "Earthquake Hazards Program," USGS (United States Geological Survey) (Web site). <http://earthquake.usgs.gov/> . Wade, Nicholas. The Science Times Book of Natural Disasters. New York: Lyons Press, 2000.